A hiccup in the second set aside, the Bulldog volleyball team delivered a solid outing overall Thursday against Lovington at Bulldog Pit, besting the Wildcats in four, 25-12, 22-25, 25-10 and 25-12. Artesia came out firing on all cylinders before a healthy home crowd, taking a commanding lead over the ‘Cats amidst a six-point service by Alexa Riggs. 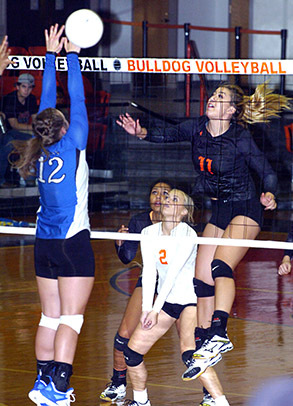 Riggs’ jump serve netted her an ace, with senior Bailey Pearce pounding home three more points via the kill to help give Artesia a 9-2 advantage. Lovington was able to inch back within five on a pair of mis-hits, 11-6, but kills from Mattie McCombs and Stacia Martinez in the service of Pearce and two from the line by McCombs put Artesia back up by 10, 17-7. Kyrah Gonzales came a point away from serving out the game from there, delivering six – fueled by kills from Malori McSpadden and Martinez, and a McSpadden solo block – but a side-out returned the ball to Lovington. The Wildcats proceeded to stave off the inevitable with a trio of consecutive blocks, but Martinez caught them off guard with a dump to end the game, 25-12. Lovington took advantage of a string of Artesia errors to go up 4-0 as Game Two began, but kills from Brile Ybarra and Dezaray Boyce helped the Bulldogs knot things up at six-all. Unfortunately, the ‘Dogs’ starting setter, Gonzales, was forced to exit the game at that point with a leg injury suffered when she skidded while attempting to avoid a net violation. The unexpected shakeup clearly threw Artesia, and Lovington took full advantage. Kamryn Cunningham delivered five from service midway through for the ‘Cats to put Lovington up 16-9, and although a trio of points apiece by Riggs and Elliot Harrison brought the ‘Dogs back within striking distance, 21-19, they could not get back over the hump, falling 22-25. Artesia was able to right the ship in the third set, however, settling back into a rhythm and jumping on the Wildcats early. Four points from Harrison and McCombs – each with an ace – helped give the Bulldogs an 11-2 advantage, and with Puentes and Boyce delivering solid hits from the outside, Artesia was able to maintain the margin through the halfway point. Riggs delivered four more to make it 21-6, and Harrison would serve out the game, 25-10, with a Puentes kill and an ace in the final point. The ‘Cats tried to regain the momentum early in the fourth bout on a four-point run by Cunningham, but Martinez was in the groove, slamming four kills home to keep the Bulldogs even with Lovington until a five-point service by Kersie Beltran put them in the driver’s seat, 13-7. McSpadden and Harrison ended the Wildcats’ next two offensive opportunities with kills, while in between, Martinez posted four more – including a pair of aces and a resounding one-touch kill by Pearce – to make it 18-8. McSapdden tacked on an ace of her own and two more points on Pearce hits to send the match into the home stretch, 22-9, and consecutive kills by Pearce ended the evening, 25-12. The Bulldogs (17-1, 4-0) will now prepare to close out their regular-season district schedule on the road, starting with a 6:30 p.m. bout Tuesday against Goddard at Ground Zero. “It’s going to be a rough stretch this next week that we have to be ready for,” Williams said. “But it’s that time of year, and I think it’s good that our district has such quality teams, because this is what gets you ready for state.